Electronic Article Surveillance (EAS) Source Tagging and EAS Tag Recirculation™ are playing a large role in the evolution of retail logistics and loss prevention. Retailers realize that in-store tagging is very expensive, time consuming, and highly inefficient, and they are looking toward solutions that move EAS tagging to the most economical place in the logistics chain – out of the store, and back toward where the merchandise is manufactured. Predictable cost of operating an EAS program. No capital requirements for additional EAS tags. Merchandise arrives at stores source tagged, secure and floor ready. More tagging consistency, less apparel damage. Maximum tagging protection during peak inventory periods. No customer issues with tag pollution, when un-deactivated EAS sewn-in labels set off alarms. 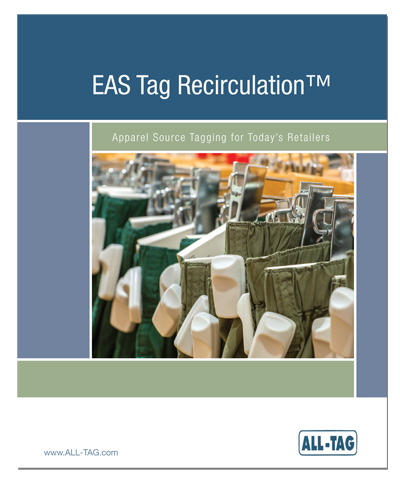 By implementing EAS Tag Recirculation, retailers achieve higher levels of efficiency and customer satisfaction through this sustainable, innovative growth program spearheaded by their loss prevention department. Simply fill out the form below and you will be automatically redirected to the full report.